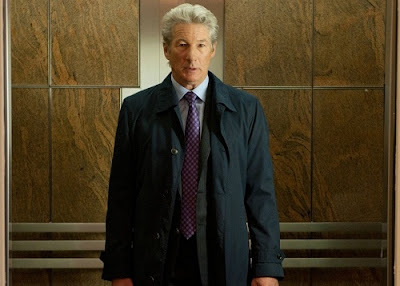 Reel Talk Online: REVIEW: Richard Gere is a Power Player on the Decline in "Arbitrage"
REVIEW: Richard Gere is a Power Player on the Decline in "Arbitrage"
Among many other things that we can blame on the U.S. recession, we can add the onslaught of money and economy-related films. While movies like Margin Call told a sophisticated story that left the characters' personal lives as a secondary aspect, first-time feature director and screenwriter Nicholas Jarecki chose to heighten the plight of the main character to provoke a nearly two-hour steady onscreen meltdown in Arbitrage. Even though its cast includes several high-caliber actors (who often go underused though accessible enough to the plot), Arbitrage proves early on in the film that its main focus will never shift from Richard Gere. This yields an even greater pressure cooker performance from the actor, who plays overconfident hedge fund superstar/Forbes magnate Robert Miller, who's desperate to close one last merger so he could replenish his company's hollow bank account and go back to living his plush life, uninterrupted. While that's happening, Robert continues to keep up the typical rich man's facade so as to not rock his professional image or that of the man he portrays himself to be for his kids or at home with his wife Ellen (Susan Sarandon) in their New York City mansion. He's even managed to keep his family's charities paid in full and maintain their wealth by employing his business savvy daughter Brooke (Brit Marling) as his company's Chief Operating Officer. But as his new business venture plummets, so does his personal life when one fateful night with his mistress Julie (Laetitia Casta) changes everything for the far worst. An extremely centered portrayal of a meltdown by Gere elevates the film from its very conventional movie of its genre. The screenplay is certainly nothing over which to get excited; it really takes a paint by numbers approach. 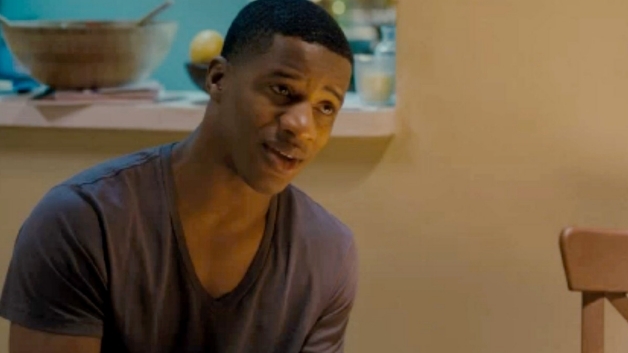 But right before it falls into an emotional dead end, the plot takes a turn for the better with the introduction of Jimmy Grant (exceptionally played by Nate Parker). Jimmy's true identity is disclosed in pieces and usually as an aside by Robert, but the audience will appreciate the significance the character has in Robert's life during this dark time, even if Robert himself doesn't always acknowledge it. In other words, the audience never really knows whether Robert relies on Jimmy only because he's in a frenzied state and thinks Jimmy has nothing to lose over it, or whether he actually thinks of Jimmy as an ally. Not only is the dialogue between the two compelling, but it is marvelous to watch two very different actors approach the same conflict without each character knowing (or caring about) the full extent of which the other lives. The ending is rather abrupt and serves more as character check-in than a conclusion, but the second act is surely worth the price of admission. It's definitely far better than Jarecki's first and only other feature, 2008's The Informers. With solid yet wallpaper performances by Sarandon as Robert's neglected wife and Tim Roth (who plays a detective investigating Robert), Arbitrage also includes a good performance from Marling. The actress takes a departure from her breakout role in last year's quirky drama Another Earth to play a completely different character with upper class punch. 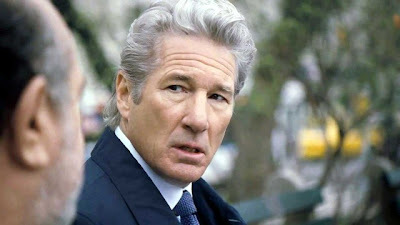 It's a shame Arbitrage itself couldn't manage to be more risky in its approach to the perhaps overused genre that audiences will likely forget come the winter, but the audience will love to watch Gere smartly tackle a character on the decline. Thanks for this review Candice. I was surprised how drawn in I was to the story. And I just read Roger Ebert's review about how the movie gets you rooting for Gere's character despite how horrible his values are! I suppose this is what an anti-hero is about. Good review Candice. Gere is not my favorite actor, but he's good here and makes this character a whole lot more interesting than he had any right to be. I don't think it deserves an Oscar nomination, but it's nice to actually see a good performance from him while also trying something a bit darker with his act. Good review Candice. Gere and Parker are the reasons to see this. I liked how they kept it real with Parker and he wasn't the "black drug dealer/street guy" that Gere went to for help. Parker's character wasn't a saint, but he wasn't of Gere's world either especially the Applebee's line. LOL. I thought it was solid, but can wait for home video on a rainy day or boring night.